Remove the electrical center cover. Always note the orientation of the relay. If equipped with a notch style relay; observe the location of the notch on the old relay to verify the new relay is installed with the notch in the same location. Ensure that the electrical center is secure, as not to put added stress on the wires or terminals. Locate the relay. Refer to Electrical Center Identification Views to locate the electrical center where the relay exists. Using the EL-43244 (1) position the tool on opposing corners of the relay (2). Use EL-43244 to pull the relay straight out from the electrical center terminals. The use of pliers or a flat bladed tool could damage the electrical center. Remove the relay (2) from the electrical center. 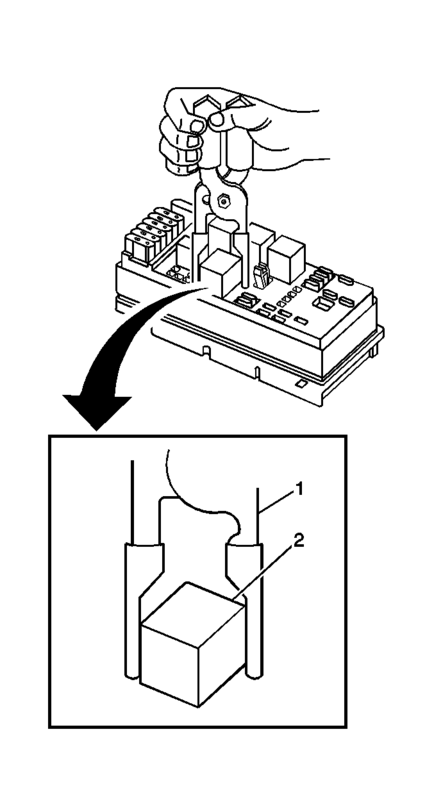 Install the relay (2) in the same position as removed. Install the electrical center cover.